I'm having some issues running the high fidelity version off of a sd launcher. I keep getting these odd scrolling diagonal lines. I've tried tinkering with the display setting when booting though swiss but not much seems to work. I am currently using original av cables. 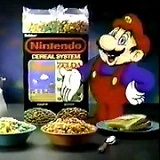 Set the video format to NTSC. That fixed the issue with scrolling lines but now there is an issue with some text and sprites gaining a static/wavey effect. this doesn't appear to effect all assets. That's to be expected with composite video. Ah, okay thanks for the help! Forgive me if it's already been asked but is there anyway to do linear scaling with gbi ? Id love to increase the size of the picture but the blurryness kills it for me. Your question is contradictory, but simply disable the image doubling filter with --filter=none. Boy talk about a brain fart. I meant integer scaling. I've tried disabling the filter and it still doesn't scale without blur. I'm outputting @ 24060 on a crt via official component cables. Is there something I'm missing ? I don't remember having issues in the past. There's nothing you can do when zooming in 240p, you need at least twice the resolution. Thanks for the help Extrems and thank you for your work ! I'm currently waiting for Insurrection Industries to post their guide on how to update gcvideo so I can update to version 4.2b. I was able to update my Carby with no prior JTAG experience after days of trial and error. Perhaps I can help. This image includes GCVideo version 2.4b, which was the newest version when I first wrote this guide. If you want the new newest version, don't skip steps 12 through 14 below. 1. Open the Carby with your fingers carefully by shimmying it open while pulling the top and bottom apart. If you can't shimmy it open, try prying at the crevice with a small flat-head screwdriver or sharp edge of something. Do this over a soft surface as it may pop out suddenly. This is the hardest step. 2. 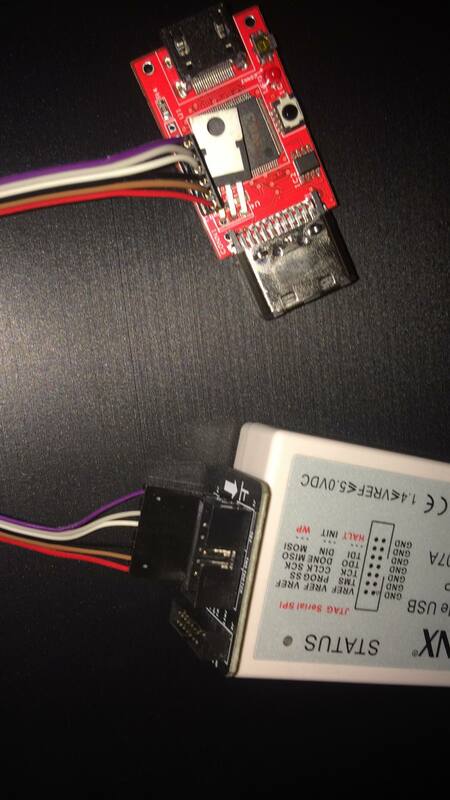 Plug the JTAG programmer into the Carby (heres a picture of how it should look: http://omik.es/cable.jpg, edit: one user had a different looking connection - his working setup looked like this: https://imgur.com/a/rjjTe7H ). 3. Plug the Carby into a Gamecube. 4. Turn on the Gamecube. 5. Plug the JTAG programmer into your computer via USB. 6. Install and open VirtualBox as well as VirualBox Extension Pack from https://www.virtualbox.org/wiki/Downloads then click "New", type any name, select Linux, Ubuntu 32bit and then 1024 MB ram. 7. For Hard Disk choose "Use an existing virtual hard disk file" and click on the folder, navigate to and select jtag.vmdk, which is inside jtag.7z above, click Create. 8. Click Settings, click the USB tab, click the USB icon with a green plus on the right, select XILINX and click OK.
9. Click Start to start the VM and wait for Ubuntu to start up. 10. Wait a moment for iMPACT to open automatically. 11. If you are trying to install 2.4b (not the latest version), skip to 15. 12. Click on the Firefox shortcut on the left, download the latest version of GCVideo. You can find it at https://github.com/ikorb/gcvideo/releases. You'll need the shuriken-v3-gc one. Extract the files to a folder. 13. Bring the flashing software back up and click on the small FLASH rectangle to select it, click on the ⋮ button in the toolbar above, select the .mcs file from the folder you extracted the files to. 14. Select SPI PROM and M25P40 then click OK.
15. Click on the small rectangle that says FLASH to select it. 16. Some options with green arrows should be on the left, double click on the one that says Program. 17. Once it is finished programming, turn off the Gamecube, unplug the JTAG from the Carby, and test it out. It should now be on the updated firmware. There may well be a better way to do all of this, but I figured I'd post this for you since I searched the internet pretty thoroughly for information on how to do this and found very little. Hopefully Insurrection Industries releases an easier guide to follow than mine, but if you are in the mood for an adventure, give it a shot. Sorry that was long, I tried to put it in a spoiler box, but in the preview at least the spoiler won't expand. Not sure why. Special thanks to neworion1 for the alternate jtag photos and adjustment to step 6. Just want to let you know that this guide is absolutely fantastic. I've been using this method twice to update my Carby (to version 2.4b and 2.4c). The only thing that gets a bit messy is the USB port detection for XILINX, I have to retry that bit until the ISE platform detects it. Thank you so much for this! I am very happy it was useful. I hadn't actually tried to update to 2.4c yet to be honest, so I am glad to hear it didn't effect the steps at all. Someday I'll dust off my USB jtag thingy and try to find out a consistent way of having the USB be recognized by iMPACT. In the meantime, do you have any tips that I can add to the steps? Did you simply unplug and replug the USB until iMPACT said it was connected, or restart the virtual machine? Hello, first time poster, I registered because I haven't been able to find a solution to my problem online and I'm hoping someone on the forums here might have had a similar experience and can help. I recently purchased an Eon GCHD mk-ii to pair with Wii component cables in order to use GBI on a CRT/PVM. The problem I'm having is that when launching GBI from Swiss, no matter the video settings, the GCHD keeps switching to 480p and won't let me switch to 240p or 480i. I have no problem using the exact same set-up with the official Gamecube component cables- GBI works fantastically. I've tried the GCHD on two different Gamecubes, on both a CRT and a Sony PVM, both booting from Swiss and using the Melee save bug trick to boot a DOL. I'm using the current revisions of the GBI software and Swiss. Have you played with the GCHD settings? You can change them on the mk-i that I have by pressing a button on the GCHD and setting it up with a compatible remote, but I assume its the same for the new one. I was actually able to use a remote I had already (for the OSSC). Yes, I've already paired a remote and played around with the mk-ii's OSD settings, but they seem to have no effect or be overwritten somehow when GBI launches- it wants to force 480p. I'll keep experimenting with both Swiss and the GCHD's own settings and hopefully come up with a solution. Eon asked me to email them details and they will look into it also. Thanks for the reply. Hi everybody, I'm new in this forum. I have a probably very silly question, but I don't know much about these topics. Since in PAL countries, the standard resolution was 288@50Hz, and the PAL GC should be able to output that, I was wondering if the GBIHF can use that to 2x the 160x144 Gameboy resolution without any added lag. Only the standard edition can do that, as it's also the only one with temporal interpolation currently. 50 Hz would be a stuttering mess. That makes sense, I guess the Super Game Boy in PAL SNES was dropping frames or something that wouldn't be pretty. So, to be clear, 288@60Hz is not possible, at all, right? Btw, love your work on this software. Thanks a lot for it! It's possible, but some kind of compromise would have to be made to fit the 13.5 or 27 MHz pixel clock. I was working on a program to convert emulator color palettes to SGB2 codes and wanted to use them on GBI. I found though that GBI seems to be interpreting the color codes backwards from how a real Super Game Boy does them. I wasn't sure if this issue was known yet, I couldn't find anything about it at a cursory glance through the thread, so I figured I should collect a bug report. It's possible this is user error, if so please educate me on what I'm doing wrong. On a slightly different topic, is it possible to tell GBI to use different color palettes for the sprite and background layers? It seems to do this on the default palette, but I can't find any way to tell it which colors to use other than --palette, which changes them all simultaneously. You're probably the first person to use this feature. Not quite. We have no knowledge of the layers. That sounds right, I don't think the Gamecube hardware can interact with the Game Boy Player hardware to identify the layers. Fixed Super Game Boy password order. 960i and 1152i are compatible with GCVideo-DVI. Hi, i recently started using GBI speedrun edition on CRT (default settings on memorycard) and while everything works well and at 240p i noticed a slight squashed image for GBA games and GB games being zoomed less than the GBA ones. Can i zoom GB games more without risking to go out of bounds when i play GBA games ? and is the aspect ratio correct for GBA games or am i the one seeing things ? In case those things can be solved can anyone tell me exactly how to set the options in the CLI file ? P.S: I am using OBS to record the gameplay, if anyone has recommended settings to get a clearer and overall better picture from recording retrogames feel free to tell me. You're seeing the wrong aspect ratio because you're treating the capture as square pixels. Scale horizontally by 10/11.